This was a nice and smooth tequila. Its aroma was little alcoholly but flavor was very enjoyable with hints of raisins and roasted almonds. I think its an okay price point for a highland extra anejo tequila. I expected more vanilla and didn't get that. Maybe this 2014 bottle was a little different. Personally I had hoped for a lot more. I put it up to my Kirkland Extra Anejo ($20) challenge and a few people couldn't tell the difference. Its definitely better than the kirkland (costco brand) tequila but not $150 better which is the price difference. I would not buy this again as I just don't see the value. Smells good, tastes carameled in the mouth and left a medium lenght final that sense carameled and a little bit smooky. I tried this one but i prefer another extra añejos more affordable with superior quality. Certainly this tequila is not bad to me because i like strong flavours like caramel, smoke and oak flavoured liquors but this one is overpriced even in México to me, even with all of this i respect this one. The bottle is beautiful designed but i prefer the tequilas of Arette house or El Secreto from Cavas de la Doña. Huele bien al principio y su sabor es acaramelado, deja un final medianamente largo on un final acaramelado con algo de humo. He probado este tequila y la verdad prefiero algunos otros extra añejos que tienen mejor calidad a un precio mas accesible. 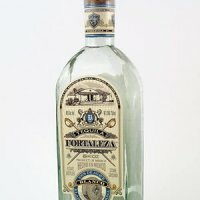 Ciertamente éste tequila no es malo (ya que me gustan sabores como el caramelo, el humo y las maderas en los licores), pero este está sobrevaluado, incluso con todo esto es un tequila muy respetable. The presentation is amber in color. The nose is full of vanilla, caramel and mild fruit. Initial taste is sharp and 'alcoholy' to me. Further tasting reveals the same alcoholy taste, with muted caramel and flora. A significant amount of woodiness can be tasted in the tequila as well. Unfortunately, I don't find any 'agave' in the pallete. 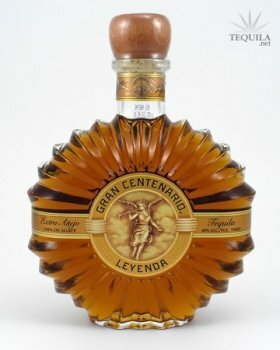 Gran Centenario Leyenda Extra Anejo NOM 1122 Tasted 5/21/07. On this date I tried this tequila by doing a blind tasting at Zocalo using a snifter. This tequila is an amber brown color and has intense aromas of fruit. There are also moderate aromas of earth, floral, and vanilla followed by mild caramel. A soft taste on the tip of the tongue leads to a low amount of sweetness with a moderate to bitter amount of bitterness. 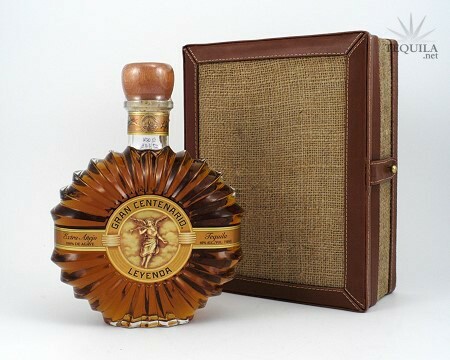 The Gran Centenario Leyenda Extra Anejo flavor contains moderate caramel, chemicals, and earth flavors with mild floral, agave, fruit, and spice. The tequila also has hints of vanilla and smoke. Gran Centenario Leyenda Extra Anejo finishes with a medium to long duration of flavor and a numbing alcohol feeling. This tequila has been awarded the overall rating of 87 points out of 100.